While looking for Windows 2 programs, I also came across this interesting shareware shell enhancement for Windows 2. 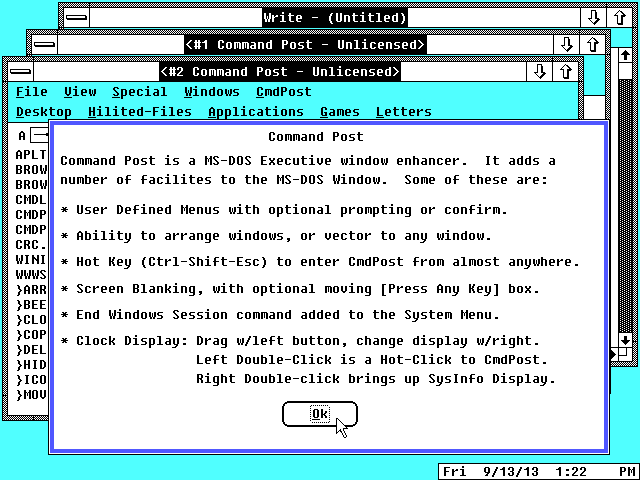 Command Post 5.2 is an MS-DOS Executive "enhancer" . The Windows 2 version is not quite a standalone alternate shell, but rather it modifies the behavior of the existing MS-DOS Executive shell. Command Post adds additional menu items to the MS-DOS executive. There are additional utilities, and custom shortcuts to installed applications. Command Post also adds a clock to the lower right corner. It is interesting to note how putting a clock in that corner was a popular thing to do before Microsoft put one in the Windows 95 task bar. 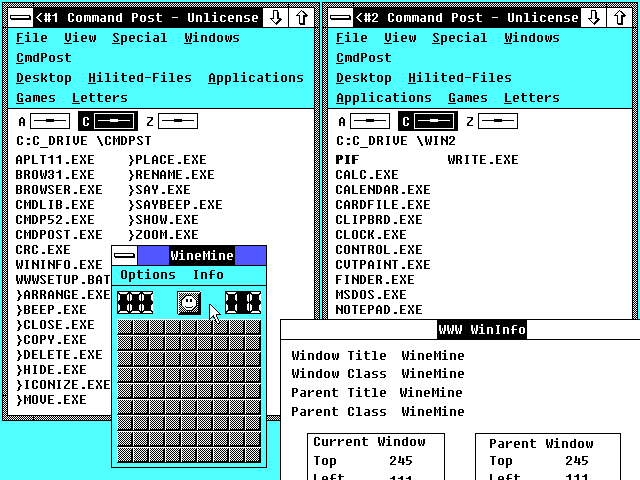 If there is a way to automatically arrange windows in Windows 2, it is not obvious. Microsoft removed automatic tiling and left it up to users to manually size each window. 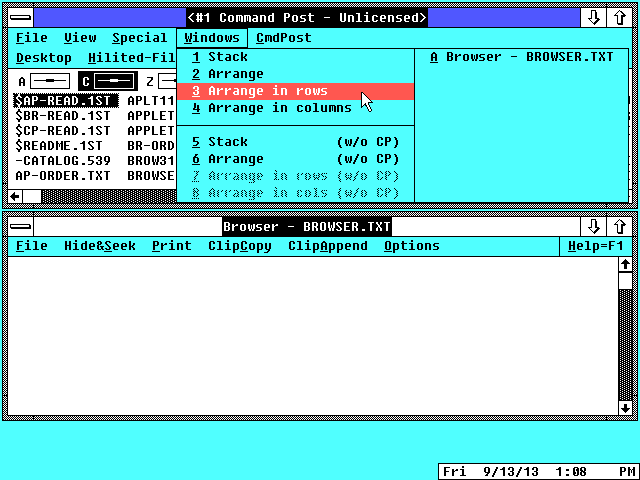 Command Post can re-arrange the windows as a cascading "stack" or as tiled rows/colums. You can find these options under the "windows" menu. Tiling is not quite like Windows 1. Once Command Post re-arranges the windows you can still resize them as you see fit. Apparently Microsoft thought this was a good idea, as they added a "cascade" and "tile" arrangement option in the Windows 3.x task manager. 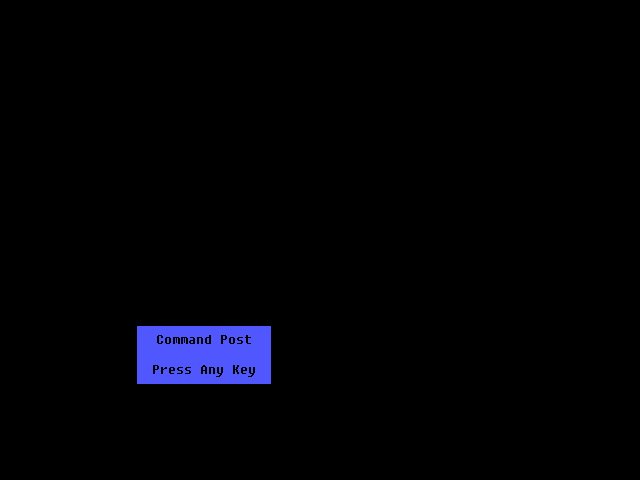 The CmdPost menu contains items for opening a new Command Post window, opening Control Panel, ClipBoard, Dos Prompt, Option, and system information. You can customize the remainder of the menus to point to any applications you want. However, there is no user interface for this. You must edit the configuration file with a text editor. Interestingly, the default Application menu lists Paintbrush, In*A*Vision, Excel, and PageMaker! The other default menus list the included Windows tools, and document templates. Windows 8 needs some menus like this! It also includes a screen blanker. Nothing too fancy to see here, but neither Windows 2.x nor the original Windows 3.0 had screen savers. Command Post bundles a number of windowing scripting tools. You can hide, minimize, maximize, or restore a window by running the appropriate executable and specifying the window name as a parameter. 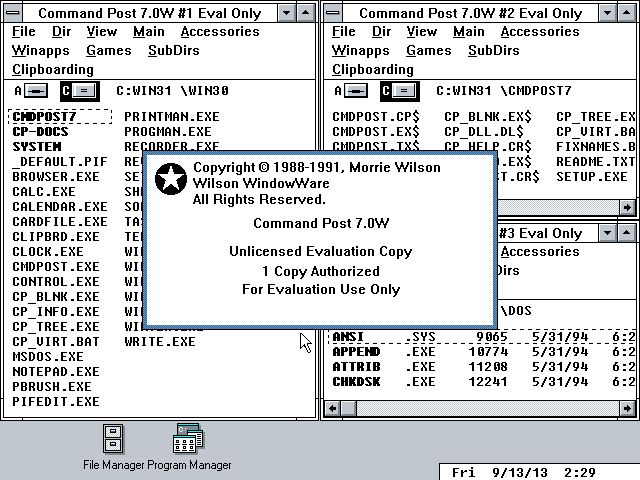 A later version, Command Post 7, is designed to exclusively run under Windows 3.x. This version appears to implement its own clone of the MS-DOS executive, and is therefore a complete shell. 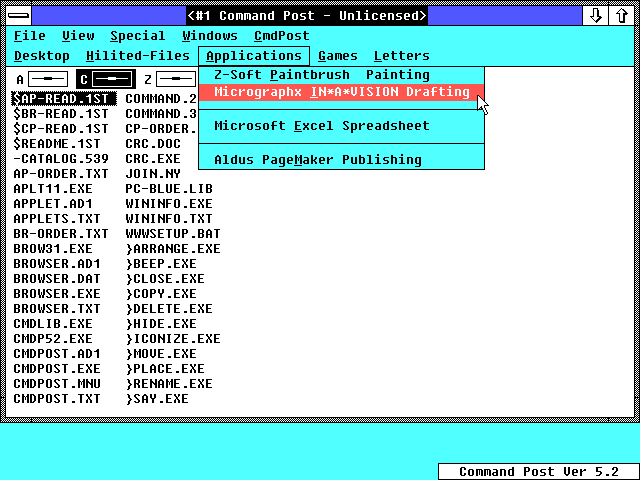 In conclusion, Command Post feels very incomplete, but provides a useful set of functional additions to Windows 2.